The daily life impact of movement disorders on people affected ranges from the inconvenient to major quality of life issues, depending upon the disorder and its progression. Topics in this issue of Neurologic Clinics address: Pathogenic Nechanisms of Neurodegeneration in Parkinson’s Disease; Treatment Strategies in Early and Advanced Parkinson’s Disease; Atypical Parkinsonism; Medical and Surgical Treatment of Tremors; Diagnosis and Treatment of Dystonia; Huntington’s Disease: Pathogenesis and Treatment; Tics and Tourette Syndrome; Paroxysmal Movement Disorders; Drug-induced Movement Disorders; Wilson Disease and other Neurodegenerations with Metal Accumulations; Psychogenic Movement Disorders; Ataxia; Gait Disorders; and Movement Disorders in Systemic Diseases. Videos are planned for the majority of the presentations and each article presents an Overview, Imaging, Pathology, and Diagnostic Dilemmas. 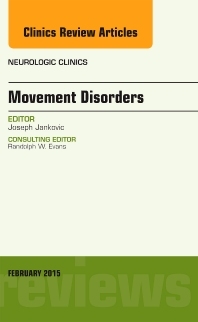 The editor of this issue of Neurologic Clinics, Dr. Joseph Jankovic, is well known as expert in the pathophysiology, diganosis, and management of movement disorders - he has served as president of the international Movement Disorder Society and is recipient of numerous research awards related to these disorders. Dr Jankovic has involved world renown experts as authors in this publication. After receiving his MD degree from the University of Arizona College of Medicine in 1973, Dr. Jankovic completed medicine internship at Baylor College of Medicine, Houston, and residency in Neurology at the Neurological Institute, Columbia University, New York City, where he was selected as the Chief Resident and also obtained additional training in movement disorders with Stanley Fahn, MD. In 1977 he joined the faculty of Baylor College of Medicine and became a founder and director of the Parkinson's Disease Center and Movement Disorders Clinic, which has since been recognized as a "Center of Excellence" by the National Parkinson Foundation and the Huntington Disease Society of America. Promoted to a full professor of Neurology in 1988, Dr. Jankovic currently holds the endowed Distinguished Chair in Movement Disorders. One of the founders of the international Movement Disorder Society, Dr. Jankovic was elected its 3rd president in 1994. He is an Honorary Member of the American Neurological Association, Australian Association of Neurologists, French Neurological Society, European Federation of Neurological Societies, and the International Parkinson’s Disease and Movement Disorders Society. Selected as a “Great Teacher” by the National Institute of Health, Dr. Jankovic is the recipient of many other honors including the American Academy of Neurology (AAN) Movement Disorders Research Award, sponsored by the Parkinson’s Disease Foundation, the Guthrie Family Humanitarian Award, presented by the Huntington’s Disease Society of America, the Tourette Syndrome Association Lifetime Achievement Award, the Dystonia Medical Research Foundation Distinguished Service Award, the Baylor College of Medicine Alumni Association Distinguished Faculty Award, and the Fulbright & Jaworski Faculty Excellence Award. Listed in Highly Cited Researcher (ISIHighlyCited.com), Dr. Jankovic had been principal investigator in over hundred clinical trials and his pioneering research on drugs for parkinsonian disorders and hyperkinetic movement disorders, including botulinum toxin and tetrabenazine, has led to their approval by the Food and Drug Administration. Dr. Jankovic has published over 900 original articles and chapters, and edited or co-edited over 50 books and volumes, including several standard textbooks such as “Neurology in Clinical Practice”, “Principles and Practice of Movement Disorders”, and “Hyperkinetic Movement Disorders”. He has been a member of numerous editorial boards including Neurology, Movement Disorders, Journal of Neurology Neurosurgery and Psychiatry, Parkinsonism and Related Disorders, Acta Neurologica Scandinavica, Journal of Neurological Sciences, Neurology Medlink, Clinical Neuropharmacology, Neurotherapeutics, Expert Review of Neurotherapeutics, Journal of Parkinson’s Disease, PeerJ, and other journals. Dr. Jankovic has co-directed the annual course “A Comprehensive Review of Movement Disorders”, in Aspen, Colorado since 1990. Invited as a key note speaker and an endowed lecturer in many national and international institutions and organizations, Dr. Jankovic has directed or lectured in annual AAN courses, MDS-sponsored Congresses as well as other international meetings. Dr. Jankovic has mentored numerous fellows and other trainees many of whom have become leaders in the field of neurology and movement disorders. Certified by the American Board of Psychiatry and Neurology, Dr. Jankovic is a fellow of the AAN and an active member of many other professional organizations. He is current or past member of numerous scientific and medical advisory boards of national foundations including the Worldwide Education and Awareness for Movement Disorders (WE MOVE), Dystonia Medical Research Foundation, International Tremor Foundation, Tourette Syndrome Association, and the World Federation of Neurology Association of Parkinsonism and Related Disorders. Dr. Jankovic has also served on the executive scientific advisory board of the Michael J. Fox Foundation for Parkinson’s Research and the National Parkinson Foundation Clinical and Scientific Advisory Board. The Best Doctors in America, America’s Top Doctors, Listed in US News and World Report’s "Top Doctors", Who’s Who in the World, and other Who’s Who references (www.jankovic.org; full CV available on request).